AJAX Shopping Cart solution provides effortless adding products to cart right from the category page. Easy to use and extremely customer-friendly. With the confirmation pop-up block customers can add, correct or remove products that have been added to cart without reloading the cart page. Additionally, you can showcase related products for cross-selling purposes. The module shows nice magento cart overview dialog, in which customers can see which products they add to cart with Ajax as well as the cart stats - the number of products in Magento 1 shopping cart and current subtotal. Very handy. Check out a great visual effect. A product image flies towards My cart link once a customer adds the product to the cart. There is a possibility to add products to Wishlist or Comparison List using Ajax. 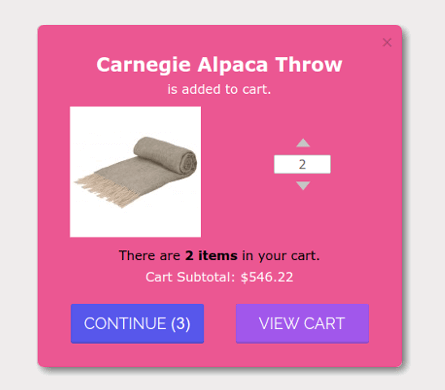 By implementing this comprehensive Ajax add to cart pop-up you can hugely increase usability by letting customers choose configurable products and custom options right on the category pages, without going to the product details view. It is possible to display either all custom options or only required. If your products have many options we recommend to show only required ones to minimize cart popup size. Use various visual style settings to configure Confirmation Window view in accordance with your Magento theme. See here how complicated checkout and poor UX can ruin your conversions. Let shoppers select options of configurable products with images right in the cart dialog window, employing Color Swatches Pro. The extension works smoothly with the brands' options and other custom themes are supported. 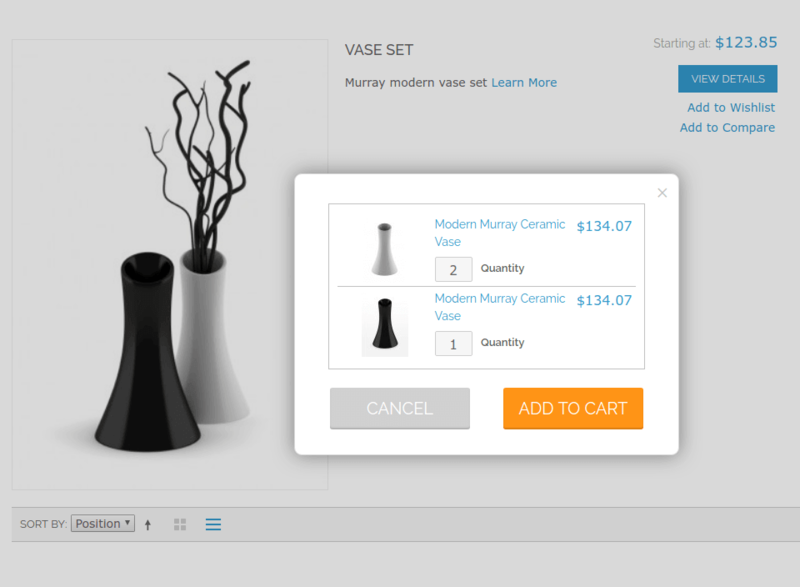 Our AJAX cart extension enables you to show in the cart dialog the products, related to the one being added to cart. Of course, customers can add the related products to cart right from the dialog window. 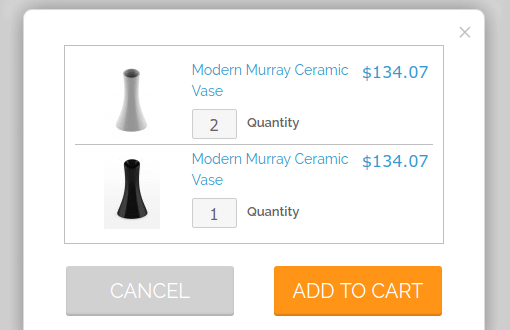 You can allow customers to edit product quantity in the cart dialog. So they can choose how many products they want to buy when adding the products to AJAX cart. Click here to find out why your cart page usability is crucial to be optimized. Choose the period for cart dialog display, which suits you perfectly. We recommend it to be not too short, so that customers have enough time to understand what's happening, see the product they've chosen and decide what to do next. Feel free to decide whether to use Magento 1 Ajax Add to Cart on product detail pages or not. You can also select the action for 'Continue' button - it can either link customers to category page or leave them at the product page. You can choose the block positionleft, top left, right, top right, center, top. While choosing a new place for your cart dialogue window, see what UX cases can never hurt your SEO showings. 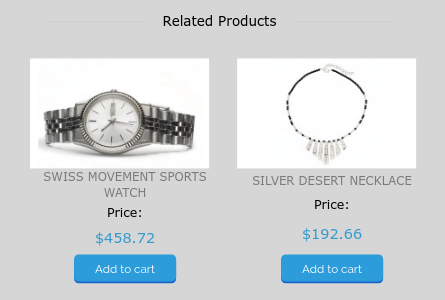 Automatic Related Products extension lets you increase sales by displaying to customers special blocks with related products based on their purchase behavior. Yes, this shopping cart module is mobile-friendly, so it will work fine on smartphones and tablets. Yes, sure, Magento AJAX Cart allows you to add to cart from category page. Your clients will be able to add products and configure their settings right on a category page. This is done in a pop-up window to ensure seamless user experience. 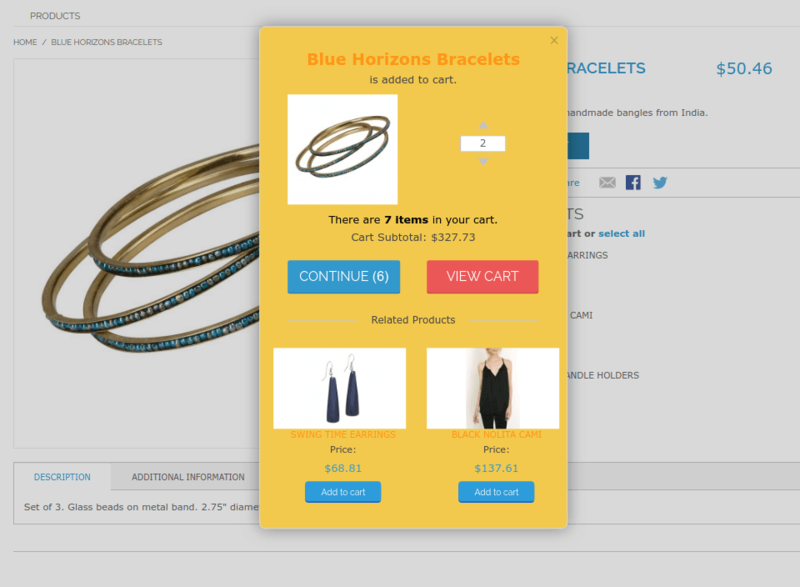 Yes, AJAX Shopping Cart allows for quantity update right in a pop-up window. For this, you need to set 'Allow to change product quantity in confirmation dialog' to yes in the AJAX cart general settings. Read on to see a screenshot. Yes, you can display upsell products in an ajax window which shows up once an item is added to cart. Yes, you can run custom visual style settings to set the AJAX cart window in accordance with your Magento theme. Read on to see a screenshot. Yes, once a product is added to cart, a client can either go to the shopping cart or continue shopping. If they choose the latter option, they can stay on a product page or go to a category page. See the complete instruction to make all the settings correctly. The Extension works great, we required some customization and the support team was fast, friendly and very helpful. We recommend the extension and Amasty. I rarely write reviews, but I'm so impressed with Amasty support team, that would be unfair if i would not write this review. Typically when a support team is this responsive it means the product needs the extra support. This one doesn't. It runs well and has a ton of intelligent features. Coding quality in superior.All my questions was about general sales optimization and speed of my entire checkout process. (my checkout process includes Ajax cart + Amasty OPC + Amasty FPC + Amasty Navigation )Wow, they gave me very detailed answers for all the questions, even offered me free extension since we got conflict with one other extenions purchased before. I work with Amasty extensions for second year now and would not even consider recommending any other extension/service to our clients if Amasty have extension for that. Highly recommended , if you are running Magento for serious bussiness! I rarely write reviews, but I'm so impressed with Amasty support team, that would be unfair if i would not write this review. Typically when a support team is this responsive it means the product needs the extra support. This one doesn't. It runs well and has a ton of intelligent features. Coding quality in superior. Wow, they gave me very detailed answers for all the questions, even offered me free extension since we got conflict with one other extensions purchased before i was aware of Amasty. I work with Amasty extensions for second year now and would not even consider recommending any other extension/service to our clients if Amasty have extension for that. Highly recommended , if you are running Magento for serious business! Die besten Extensions und profi Support von Amasty! After using another developer's extension which didn't quite do the job, we settled on Amasty's extension, and were pleasantly surprised to learn that it could do ajax add to compare list and wishlist as well. The extension was easy to setup and customize, and with a little help from their star developer Alexey, we were able get the extension working with our custom theme, all within a matter of hours after purchasing the extension. A feature request for a future version would be to please include ajax removal from Cart and Compare, but overall this is now one of our standard extensions that we will be using on our sites. Well done Amasty, on an excellent product and even better support! Great item and all issues were quickly addressed by support. Great extension to simplify the ordering experience for our customers who already which products they want out of the hundreds of products we have. With this extension they can order right off the category page. And great support for fixing any problems or doing customization. Amasty - Another Fantastic Extension! I can't say enough good things about Amasty's extensions, and this one is yet another winner. Highly recommended extension, and highly recommended company... two thumbs up! I myself hate being redirected to a shopping cart after adding an item to it. Guys, I haven’t finished yet, I don’t want to get back and start looking for the needed products from the beginning! So in my store I’m trying to make user experience as friendly as possible. This extension is a real catch, it makes shopping in my store more fun. Customers just add products from product pages or even categories and can choose to continue shopping, no redirects. That’s awesome! Your support works amazingly. Had I written a ticket they answered me immediately and helped to set all the configurations needed. Thank you so much. You could trust amasty's extension and amasty's team. Extension and support are so professional. As i previously said, i get a plan to harmonize my extensions with more amasty's extensions as possible. Good extension that makes the store a bit more modish and fluid. Such little things are really worthy! The module makes the shopping process much easier for our customers and it's fully compatible with other extensions we installed before. Well done! You know, this small tool has made a miracle! I've already got a couple of positive reviews from my customers - they are highly satisfied with the ability to add products to cart without interrupting the whole shopping process. No page reloads, rapid adding products to cart - this is what our customers needed! The tool that really works! It's a great idea not to slow down the customers on their way to purchase, the easier the process of adding goods to shopping cart, the more conversions you have. This really works, and I'm glad I've installed this tool. Even better than I've expected! Not only the extension does everything it promises, but the support team is doing its best! I'm totally satisfied with the extension and I'm sure that this is not my purchase here. This extension just made my day as soon as I installed it! I had no problems integrating it with other Amasty modules and it nearly flies! I really like the extension. It made my store a lot more user-friendly and visually attractive. Some customers even said thanks to me. And the support is great as usual! I bought several modules from Amasty and plan to buy more because their support is truly excellent. When I hit some problems with the AJAX cart clashing with other third party modules they fixed issues for me extremely quickly and without fuss. I highly recommend this and other Amasty modules. It works just fine out of the box! Great extension. Handy and very fast. It is a great extension and works really well just as described. I had few issues regarding compactiability with others extension functionality but these issues fixed by support guy's straight away in less time. Good experiencce to work with you..
Amasty Ajax Shopping Cart Is A Wonderful Extension! This extension by Amasty is wonderful and works very well. Functionality is above and beyond, and the visuals are also very pleasant. Amasty support fixed a few little thing for me without any delay - very impressive. Very Highly Recommended - both the extension and the developer! This is my 6th Amasty Extension and it works perfectly. Every time I need additional functionality I research every comparable extension option and it always comes back to choosing Amasty. Support is generally very prompt and always thorough.I know if something goes wrong I can count on them to take care of it. I definitely plan to buy additional extensions from them. It's clear they know Magento well. I highly recommend Amasty without hesitation. I have like ten different extensions from Amasty and the main reason is that everything is well-built and usually works out of the box. This time I was working with a strange "non-standard" theme and knew that it was going to be hard to integrate more ajax-stuff. A few days later Alex at Amasty had taken care of it, integrated the ajaxCart and made the little beauty work as expected. It's nice looking and has a smooth way of working. It's also easy to customize if someone wants to do that. Thank you Amasty! – Better compatibility with "cross-sells" block on shopping cart page. – Bugfix for related products. – Improved compatibility with Color Swatches Pro. – Correct handling of taxes. – Ability to disable AJAX cart for some "add to cart" buttons using css class. – Fix for https URLs. – Nice visual effect - flying product image. – Bugfix for quantity field in popup window. – Fix for jquery conflicts. 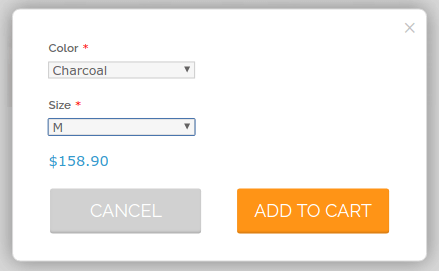 – Possibility for customers to specify product quantity in the cart dialog. – Support of all product types. 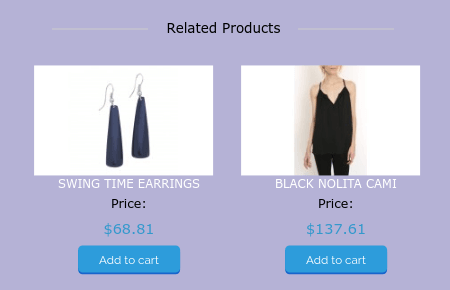 – Ability to display related products block in the cart dialog. – Bugfix for shopping cart sidebar block (reloading cart).